In the 19th century, the “penny press” revolutionized journalism by covering news that appealed to the broadest possible public. Today, as media organizations struggle to monetize online coverage and chase tech trends, they have all but abandoned less-than-affluent readers — and with them, the commitment to public service journalism. According to Pew, fewer than half of Americans who make under $75K a year go online for news. This panel will reconsider the digital divide in terms of information as well as technology. We’ll explore how low-income and working-class people – the majority of Americans – can be included in the future of online news. We’ll discuss new models for participatory, data-driven local journalism. We’re not trying to save newspapers or kill them off. Our aim is to help bring journalism back to those who punch a clock. This Future of Journalism Track is sponsored by The Knight Foundation. Murders and festivals. Easy to report. But actual news needs go unmet. 1 in 2 americans are low-income. Why is news worth paying for? 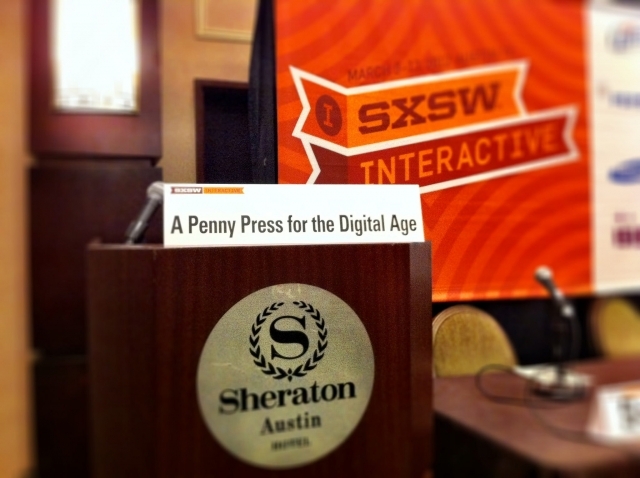 Why a penny press? Why go back to the horse and buggy era. Short stories, layout easy on the eyes, indie publishers. People cared about the news because the news cared about them. Advertising started to steer articles to meet demographic needs. Heading toward a more divided media system. Not just a digital divide but also a content divide. We need a better media system, not built around what advertisers want or need! Need to be on a platform (probably SMS) that is readily accessible. 1/10 non-users say they would like to start using the internet in the future. Converse, 90% don’t want it. Digital Divide - Institutionalized poverty. Empowerment divide - don’t know what I’d do or how I’d do it. sets out to serve everyone. an offer - if you ever bring me one news story from any widely available source that does not by the 4th paragraph quote an expert regarding what these numbers mean to the markets you get $20. 65% of American households have a net worth of $20K or less. Is the return on investment the most important thing? No, we’re looking for where we can get a better job. (WSJ article on mining in Australia). Before 1975, newspapers aimed for 100% market penetration - got to around 80%. Now they aim to reach 40%. How did this happen? Discounters drove away the smaller stores that were the majority of advertisers (small shops). Newspapers sought out upscale advertisers that have money to spend. Newspapers are no longer relevant to those that don’t have money. They are not in their target audience. If it ain’t there, you can’t aggregate it. It all hinges on original reporting. Disconnect news reporting from advertising. How? IMPACT - If you cover these (important) stories, clicks will come. The one place where you cannot ignore poor folks is when that is who your audience is. Why a digital project for rural newspapers? Poverty doesn’t decrease the interest in news. Small newspapers can’t invest in accountability reporting. Poor people are online just enough to form a plurality. People are not picking up ads - instead they’re using Facebook, craiglist, etc. Quality of news coverage? Often just reprint press releases (commodity news coverage). Low cost. Need to lower the cost of doing business. Need a more robust news because it is central to democracy. How to finance the Voice of OC? Can’t live on foundations forever. Have to develop other ways to generate income. Premium product. Inside government news market. Co-op’s - for profit vs non-profit models. None of these models have turned out to be self sustaining and replicable. Co-op is a third sector. Is there a model for successfully engaging the poor communities? Activities at the libraries are not being broadcast OUT of the library. Libraries as maker spaces - podcast, etc. Community editorial board. Brought in community connectors and they act as the editorial board.